Every so often some flavors come together that just scream “serendipity.” The gods of food karma smile on this dish for sure. This is one that I have been making for more than 20 years, and it is my wife’s favorite. I am making it for her today in celebration of 20 years of happy marriage. Some things are just made to go together. 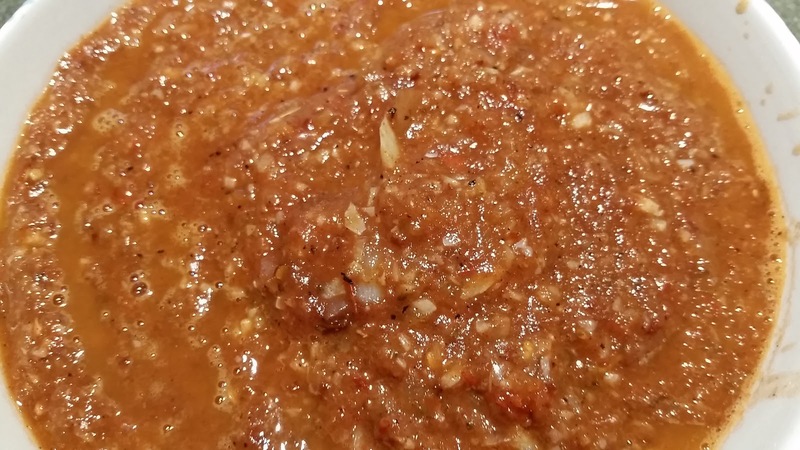 This dish came about by wanting to branch out with different salsa recipes. I found the base recipe in a book that explained about roasting the ingredients in a cast iron skillet. Yes, people actually used to use books to research topics. 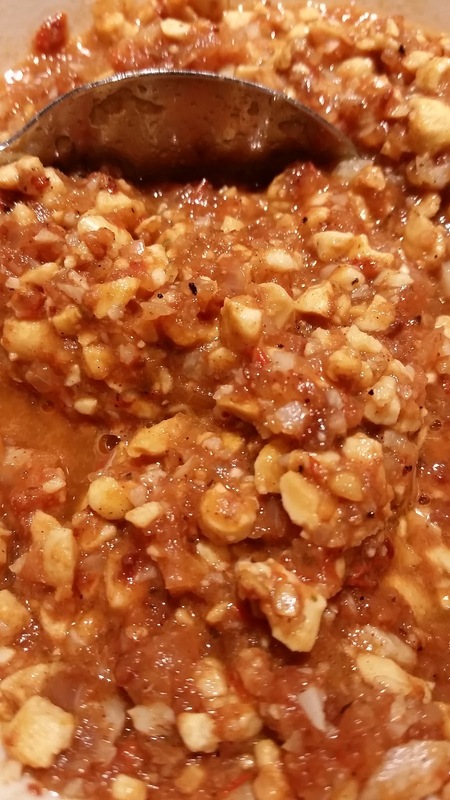 This particular salsa added peanuts at the end and suggested serving with roast pork. I made some tweaks to the recipe and made it my own. Start by seeding 3 chipotles in adobo. 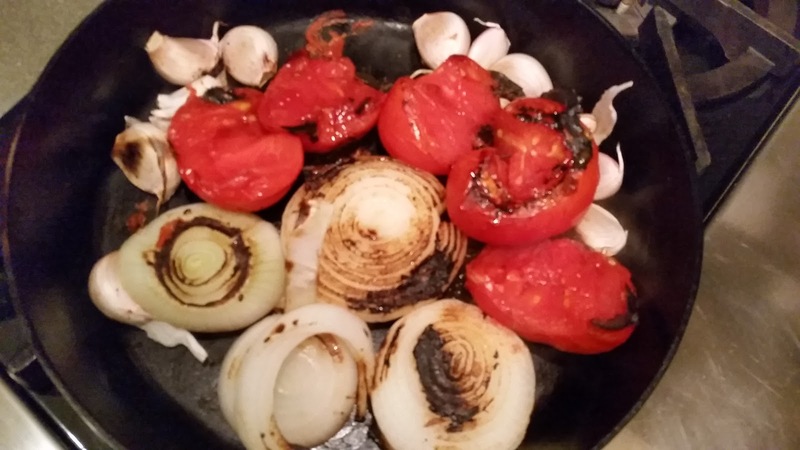 Blacken a white onion, 3 medium tomatoes, and 12 cloves of garlic in a dry cast iron skillet. 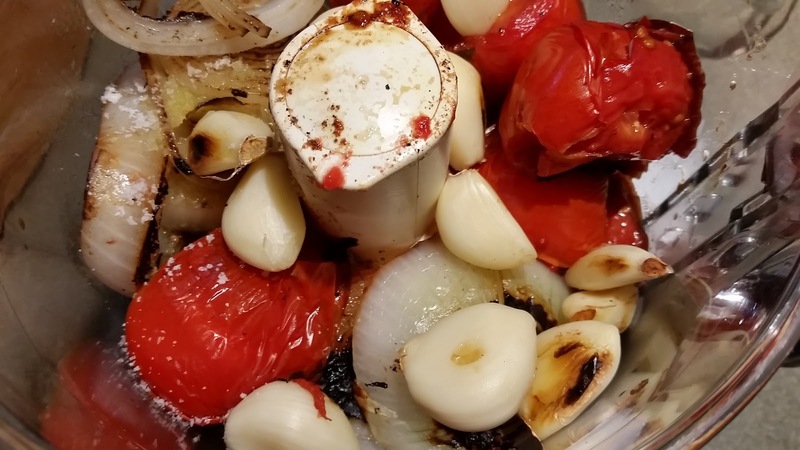 Peel the roasted garlic and add with the tomatoes, onion, and chipotles in a food processor. Add some salt, pepper, 1 T olive oil, 2 t fresh oregano, 1 t Saigon Cinnamon, a pinch of cloves, and a squeeze of lime juice. Pulse to puree. Remove the salsa to a bowl. Add ½ cup unsalted dry roasted peanuts to the food processor and pulse the coarsely chop. To about a cup of the salsa, stir in half of the peanuts. Lay out some banana leaves in an overlapping pattern on the countertop. 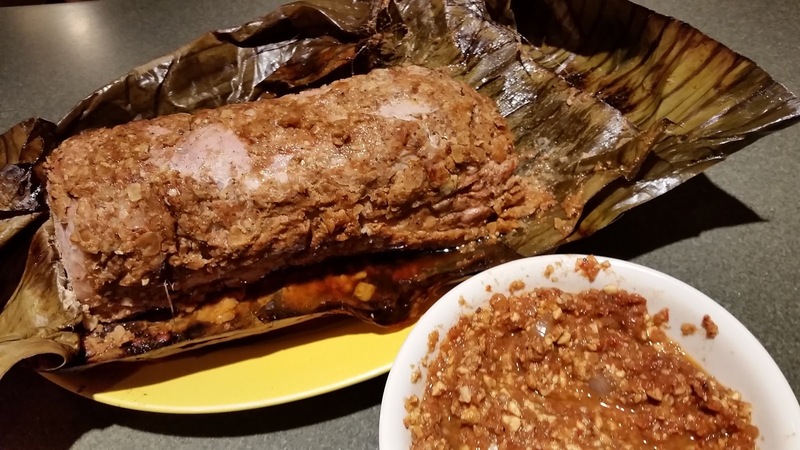 Place a 2-3 pound piece of pork loin in the center of the leaves. Coat the meat with the peanut salsa on all sides. 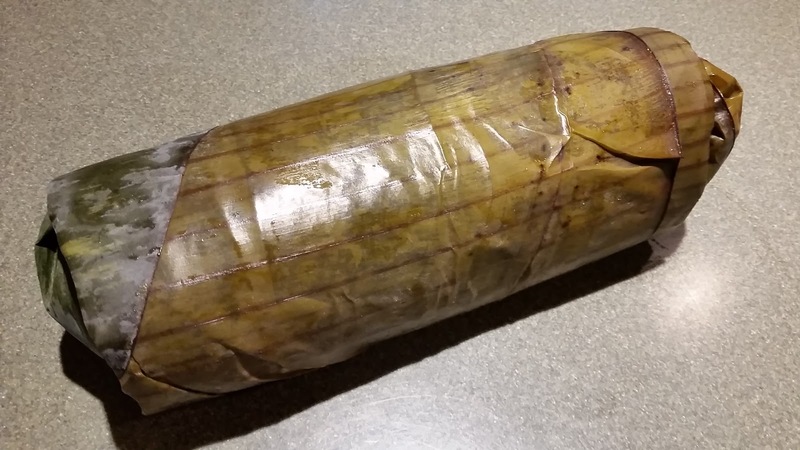 Roll the loin up like a burrito or egg roll to seal. Light a charcoal fire in your grill. Set up for indirect grilling. 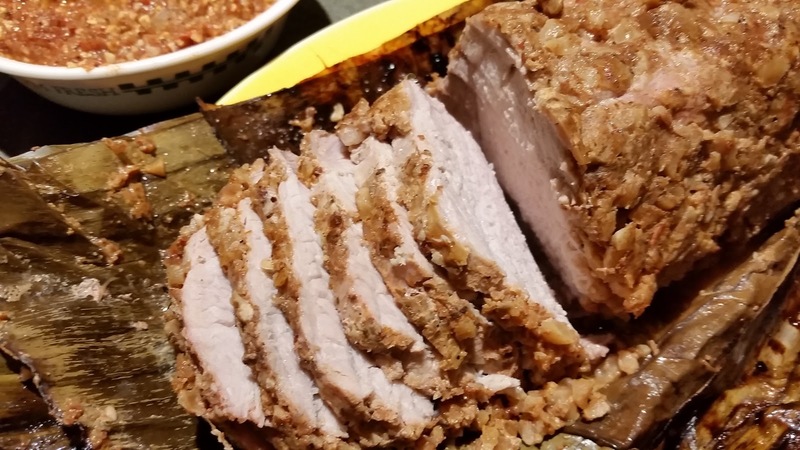 When the grill reaches 350F, place the loin on the grill not directly over the coals. 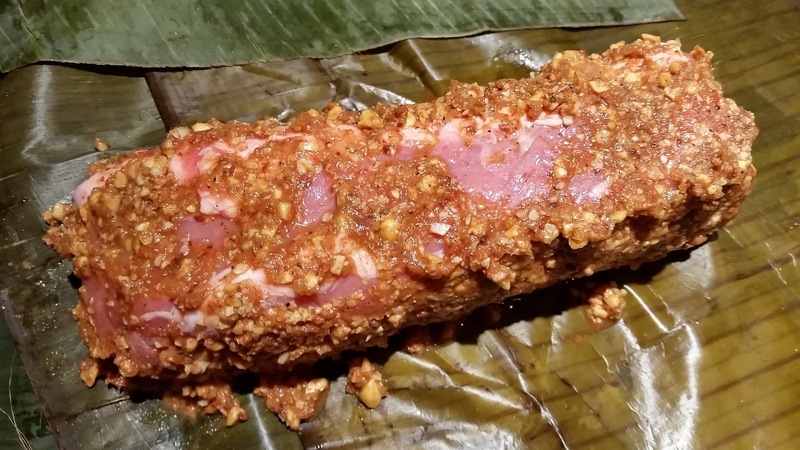 Roast the wrapped loin until it reaches 145F. This may take 2 hours depending on the size of the loin. Remove the meat from the grill, and let it rest for at least 15 minutes. Unwrap and slice thinly. You can serve this as-is, or use it to make tacos with warmed tortillas. Serve with the reserved room temperature or slightly warmed salsa, adding the peanuts right before serving (otherwise, they will get soggy).